Skill Hire have been awarded the new PaTH contract with Department of Employment commencing in April 2017, to deliver Employability Skills Training to jobactive and Disability Employment Services (DES) clients. Prepare helps young people become job ready by providing intensive pre-employment training. Employability Skills Training (EST) gives young people the opportunity to enhance their employability through two different blocks of targeted training. Participating in training will help young people understand the expectations of employers in both the recruitment process and as a new employee in the workplace. Training block 1 courses will equip young people with industry specific pre-employment skills and prepare them to meet the expectations of employers. Training block 2 courses will focus on job preparation and will equip young people with advanced job hunting skills, career development, interview skills and the opportunity to participate in Industry Awareness Experiences. These experiences will provide job seekers with an insight into the tasks and duties of different industries. Young people can do one or both of the courses. Each block is 75 hours of face-to-face training. Skill Hire’s training blocks will be delivered in Perth Metro, South West and Adelaide North and will be tailored to Construction, Hospitality, Retail and Aged Care industries. 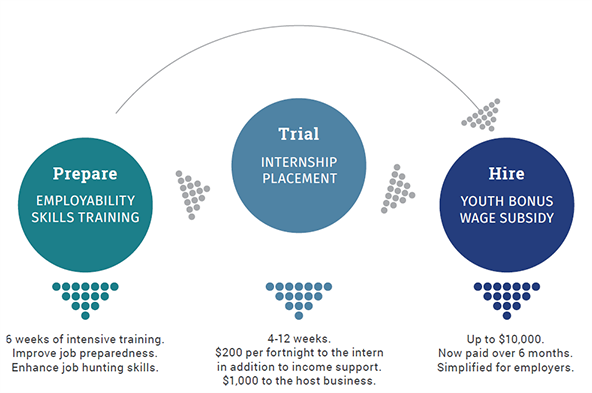 The Trial and Hire elements of the PaTH program provide the perfect opportunity for Skill Hire’s “one stop shop” model to come into effect. Group Training and Labour Hire employer relationships are maximised to achieve positive employment outcomes for participants while securing significant wage subsidies. Trial provides young people with voluntary internship opportunities to help them gain real work experience in Australian businesses. Employers can trial a young person in an internship for between 4 and 12 weeks to see how they fit into the team and if they are suitable for ongoing employment. Interns are unpaid by the business and receive a fortnightly incentive paid by the government. Hire provides an incentive of up to $10,000 paid over six months to employers who hire an eligible young job seeker. All wage subsidies will be made simpler, and can be packaged with Australian Apprenticeships Incentives Program payments, to encourage employers to create apprenticeship and traineeship opportunities.